I’m back again today with another page from this past weekend. 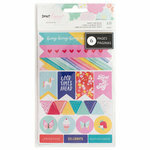 I was lucky enough to be able to spend a lot of time in my Crafty Club Playbook, using the new Treasured Collection. I hope you don’t get tired of me sharing my pages from the Faithful Life Challenge in the Playbook, because I just love it so! It is so appealing to my eye when I’m finished, and it’s such a breeze to create, leaving more time to memorize my verses! So be prepared to see a lot more of that!